What is a good adventurer? Is it the daredevil who leaps a chasm in the hope that they can reach the dangling chain and strike the head cultist before they can finish their unholy ritual? Or is it the careful planner, who skulks in the shadows assessing the dangers around the demonic altar, sets up a trap and, with a clever ruse, tricks the cultist into it? Is a good adventurer the loner who fights a personal crusade against evil or the loyal friend who lays down his life to give his friends a fighting chance in their darkest hour? There are as many definitions of ‘adventurer’ as there are adventurers, with all their nuances, approaches and different personalities, themselves. Adventuring is a dangerous and fickle career and there are as many heroes as there are villains who have gained fame and fortune by setting out into the unknown, armed with wits or brawn, weapons or magic, willpower or stamina or, most dangerous, a mixture of all of them. Even the word ‘adventuring’ itself lends itself to much confusion, for common people view a self-professed adventurer with a mix of awe and fear, for they are not sure if they are dealing with a selfless crusader or a ruthless mercenary. One thing they can be certain of, however, is that they are a person with extraordinary abilities, the potential to solve any problem or to bring equally extraordinary grief. This book presents everything a character needs to become a successful adventurer, from detailed advice on how to get the most out of every piece of equipment to what to expect when traveling outside the boundaries of his own world. The book is divided in three parts, opening with The Adventurer’s Craft, which gives detailed advice on the options that depend on the adventurer’s own efforts and planning. It starts with the matter of equipment, sometimes a deciding factor in the success or failure of a plan; while the next chapter explains matters of tactical importance, centering on the adventuring party and the roles that each character can fulfill within one. Next come an exhaustive look at the role of magic and its uses in the different situations that adventurers might find themselves in and the options a spellcaster can choose when specializing in certain tasks. Finally a chapter dealing with the establishment of a home base, a place where adventurers can rest, recover and regroup. The second part is A World of Adventure, which focuses on those aspects of a character’s life that are outside of his control and to which he must adapt and learn before trying to survive or thrive. This section starts with the most common milieu of an adventurer’s travels: the wild places of the world, which include the underground landscapes where evils lurk. The next chapter details civilization, where adventurers find challenges of a very different nature. Last comes the strangest adventuring stage of all in the form of the otherworlds, the alien planes of existence that are the home of gods, demons and all sorts of fantastical creatures. 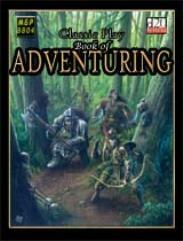 The last part of the book, Playing the Adventurer, consists of topics that focus more on the players than on their characters. Featuring optional activities they can take ‘out-of-character’ and outside of the game to improve the flow of a gaming session, as well as to solve disputes and use all the tools that Internet technology offers contemporary gamers. Armed with tons of advice and options, adventurers will find an answer to most of the situations they are bound to encounter within these pages and, even if they do not, at least there will be a few pointers, which can be adapted to the circumstances.